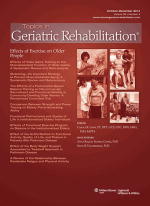 This systematic review and meta-analysis aimed to evaluate the effects of video game exercise training (VGET) on the musculoskeletal function of older adults. The review was carried out in the PubMed, LILACS, WEB OF SCIENCE, WEB OF KNOWLEDGE, PEDro, and Cochrane CENTRAL. Sixteen controlled clinical trials were included, and the risks of bias were measured using the JADAD scale. There was no evidence that VGET might be effective on functional mobility (standardized mean difference [SMD] = 0.23, 95% confidence interval [CI]: −0.13 to 0.59) or on balanced self-efficacy (SMD = 0.15, 95% CI: −0.29 to 0.60). 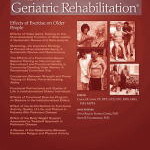 Future randomized controlled trials with greater methodological rigor, focusing on the parameters used to prescribe the exercises, are necessary.